Humans love to share, and social media is the perfect avenue for your family and friends to engage in your wedding, both leading up to the big day, in the moment, and years after. Social media is part of all of our lives, so it’s only natural to want to find fun ways to incorporate it into your wedding. 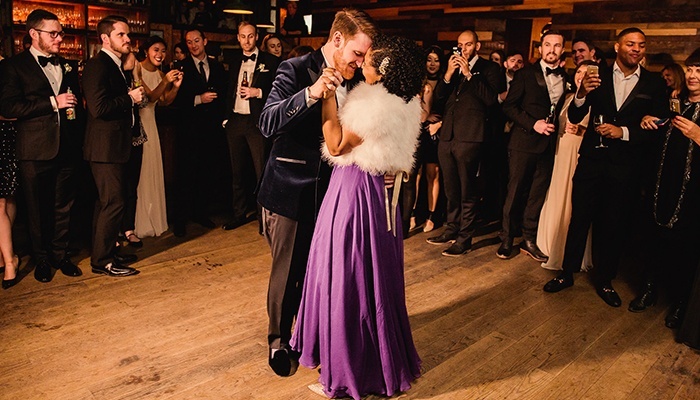 Your guests and loved ones can share their favorite moments, selfies, and memories of your wedding celebration from your engagement through to your post-wedding brunch. We have a few tips to share regarding social media best practices, and how to use various platforms to enhance your wedding! Hashtags are the simplest tool for organizing all of the lovely posts your guests share. This is why—if you are looking to incorporate social media into your celebration—deciding on a wedding hashtag is step one. When it comes to hashtags, creativity is key! Get clever with your future spouse and come up with something personal. A good starting point is playing around with puns using your first or last names, and from there the sky’s the limit! Pro Tip: order delivery, open a bottle of wine, and spend an evening with your other half brainstorming hashtags. Start with your names, where you met, your favorite spots, and inside jokes. No matter how your hashtag progress goes, you will share a fun night reminiscing on your favorite moments, which is the whole point of using social media in the first place! We call that a #winwin. 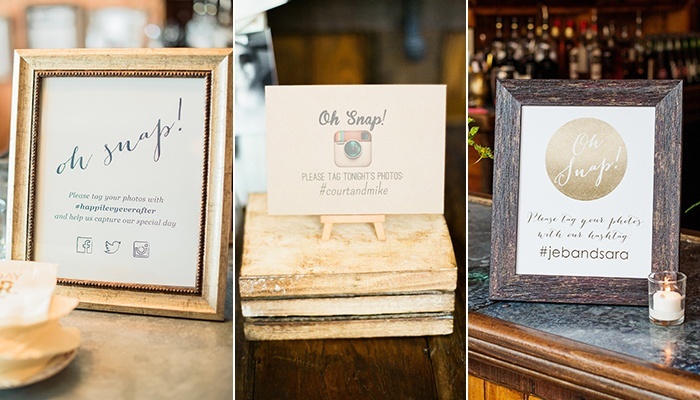 You have decided on a cheeky, charming, or just plain cute wedding hashtag—hooray! Begin cultivating photos from the moment you select it, and think of ways to get the word out to your guests so they can use it too. Leading up to your wedding day, make sure your hashtag has a prominent place on your wedding website, and consider printing it on your save the dates or invitations. 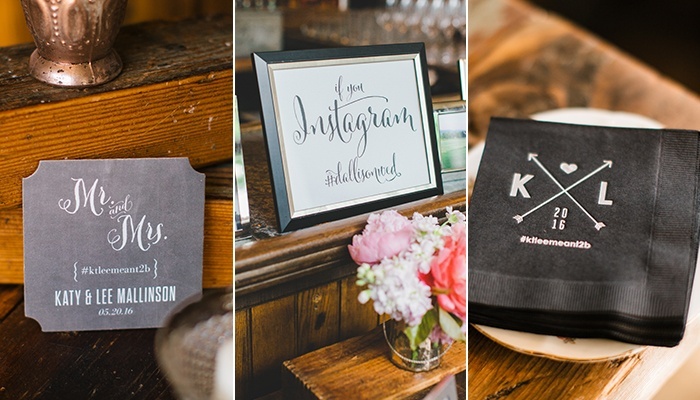 There are tons of creative ways to showcase your hashtag to your guests the day of your wedding. Consider incorporating it into personal decor items: printed cocktail napkins, favors, coasters, chalkboards, or framed signs on the bar. With any luck, you’ll wake up the morning after your wedding, open Instagram or Facebook, and find a plethora of photos posted by your guests! Using Instagram is an easy yes, as your guests will most definitely be sharing your wedding day with their favorite filter on their feed. However, lately we are seeing more and more couples opt to go the extra mile and include Snapchat in their wedding planning. If you are an avid Snapchatter, why not design a custom wedding geofilter for your day? It is an inexpensive, fun personal photobooth. Snapchat offers dozens of templates to customize and if you are feeling really creative, design yours from scratch! Our gut instinct is to share all of the big moments in our lives with those we love, and while sharing is awesome, be careful not to overshare. Go wedding dress shopping, but skip the Insta of you in your dress until you walk down the aisle. 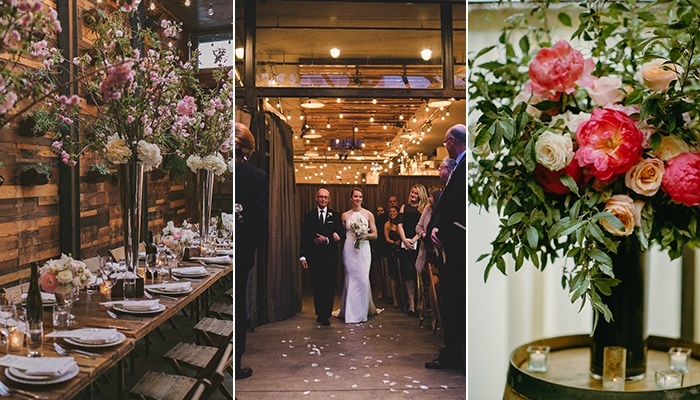 Keep your wedding florals a secret until guests can see for themselves. You want those wow moments! 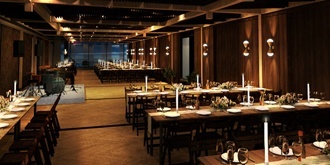 Wedding planning can be stressful, but it also should be fun. If you need to blow off steam, do it offline. However much or little you choose to share, the day is about you, the one you love, and your life together. Your wedding should be an expression of your relationship and the things most important to the two of you. So do what feels right and skip what doesn’t. Social media is supposed to be fun, so ultimately don’t take it too seriously, and let the hashtagging begin!